Mocha Java Custard is a party for your diner’s sweet tooth and only takes 10 minutes to make. We have played with the flavors a little bit by adding some ground coffee to the mix. Another variation would be the flavor of the chocolate chips. You can alternate with white chocolate or even cinammon chips for that extra twist. This dessert works best in buffets! Make 1/4 inch thick cake slices and place in a deep serving dish. Bring milk to boil and add sugar. Allow it to simmer for a few minutes. 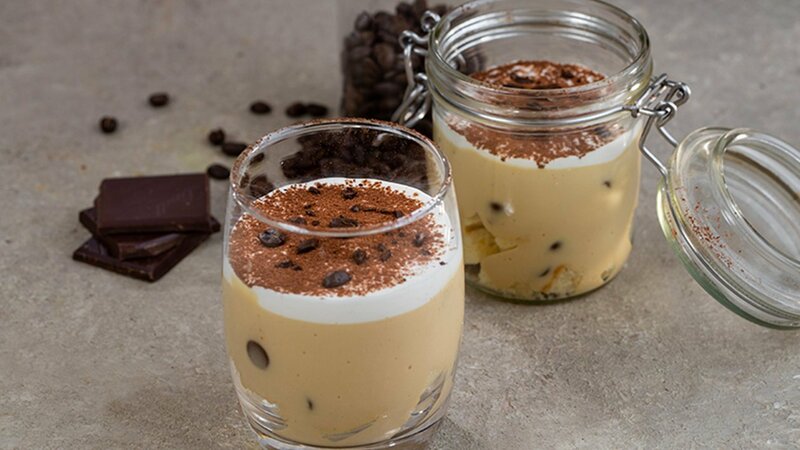 Mix Rafhan Vanilla Custard with 1/4 cup of water and add to milk along with chocolate chip & coffee. Cook for few minutes till it starts to thicken. Pour over cake and let it cool on room temperature. Using a piping bag to cover the custard with whipped cream. When ready to serve, sprinkle cocoa powder using a fine strainer and top it with Carte D'or Chocolate Topping.